Running and cycling enthusiasts Rob Peevor and business partner Stuart Young first came up with the idea for their business Medal Reward after embarking on a new fitness regime in 2016. Rob tells us more about their start up-journey and inspiration for starting the business. Can you tell us a bit more about Medal Reward and the service you provide? Medal Reward provides virtual running and cycling challenges that can be completed at a time, place and pace of the athlete’s choice – anywhere in the world. We reward all our athletes, of any ability, for their efforts with a goody bag containing a uniquely designed medal. What would you say is different about your business? We are proud to offer excellent customer service to our athletes and aim to dispatch their goody bag with 24 hours of receiving the evidence of their event. We use bespoke designs for our high quality medals so these medals cannot be found anywhere else. Stuart’s daughter, who is 8 years old, designed our first award. We are very proud of her Summer Smiles medal! What inspired you both to start the business? Both of us have been overweight and found that exercise is the key to keeping us healthy. We had been disappointed after completing running and cycling events where the medals given to us were of a poor quality or design. 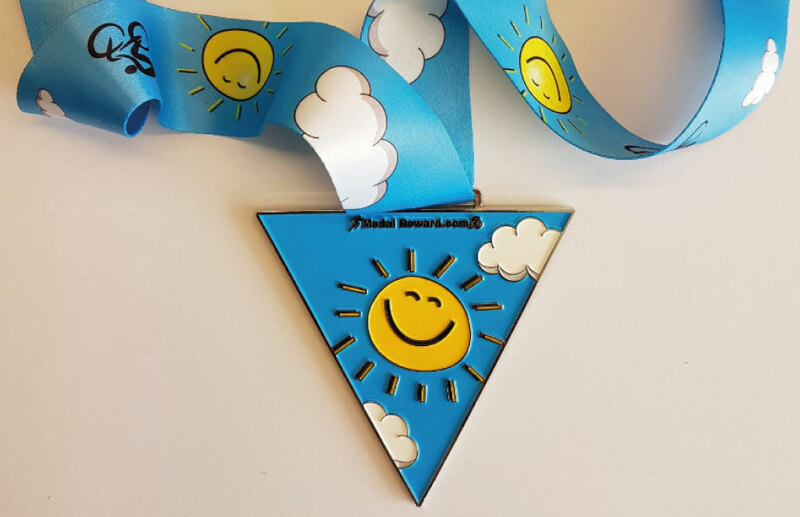 We wanted to inspire and encourage others to become more physically active by offering a unique medal and goody bag as a reward. As running and cycling becomes more and more popular year on year we believe people will want new challenges that they can do wherever and whenever they want. We feel we have something special to add to the market and have the drive and passion to succeed. How has the business benefitted from the support you’ve received from Nwes? In addition to the benefits of virtual tenancy at Felaw Maltings, our associations with Nwes and Business Advisor, Lou, have introduced us to other new businesses. This networking has given us support, encouragement and opportunities that we might not have had access to without Nwes. Lou’s support and advice has been invaluable to us as we have never started or run a business before. We are grateful for her time and expertise as we find our feet in this new world! What have been the challenges and highlights so far for the business? The challenges have centred on sourcing our products from China. Communication can be difficult but luckily we have built a good working relationship with a trusted manufacturer who has an English speaking representative with whom we work closely. The number one highlight has to be the first sale – all of a sudden it was real and happening! We gained our first customer in July 2017 and felt amazing that it was finally happening! This is an idea we had over a year ago and it has taken months to get everything ready to be able to supply our service to the public. Working together has also strengthened our friendship. What does the future hold for Medal Reward? We hope to have built the business so that we are offering a regular stream of events to our customers. We would love to start organising live running and cycling events to encourage our everyday athletes in the real world. Be brave and take the plunge. You will never regret trying but if you don’t try you will always wonder what if? Be prepared for things to take longer than you might expect and plan for contingencies should things not work out how you anticipated.